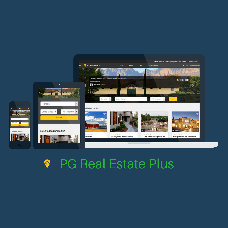 PG Real Estate Plus is an established solution for creating a high-quality real estate site. PG Real Estate Plus includes a wide range of options to post a property like highlighting a listing in search results, lifting it up in search, making a property featured on the main page, and more. PG Real Estate is a powerful real estate CMS for real estate professionals and entrepreneurs. This real estate script is mobile- and SEO- friendly. It supports easy management of site colours, dynamic blocks with information, custom fields in user profiles and listings, listings import and export, an extensive list of payment gateways (including SMS payments), paid services, user ratings and feedbacks, and much more. - Notifications about new matching listings. Your site members can subscribe to receive notifications when there is a new listing on the site that matches their search parameters. The information will be sent to their email address. - Photo slider in search results. People will be able to view all of the photos of the property directly on the search results page without viewing each listing separately. It will help them save time. - Free listings. Let your site members post several listings for free before they have to pay for the service. The idea is, they will be allowed to have a certain number of listings (i.e. 1, 2, 3, etc.) posted on your site at the same time but if they want to post more, they'll have to pay for each new one. It's a great and subtle way to monetize your real estate website! - Pop-up banners. Pop-up banners attract much more attention than static banners. The feature will help you announce different events or promote special offers on your website. - Google AdSense banners. AdSense is a free and simple way to earn money by displaying targeted ads next to your online content. With AdSense, you can show relevant and engaging ads to your site visitors and profit from it. - Country/district level. Is your website targeted to one country, region or city? Activate the add-on and select the desired location type for the display on your website. - Listings widget. Promote your listings on other websites with the help of the listings widget. It displays 20 random listings from your real estate site with your logotype, colours, country and currency.